We recently had the pleasure of being interviewed by Sierra McClain, a writer with Afro-Punk.com in NYC. 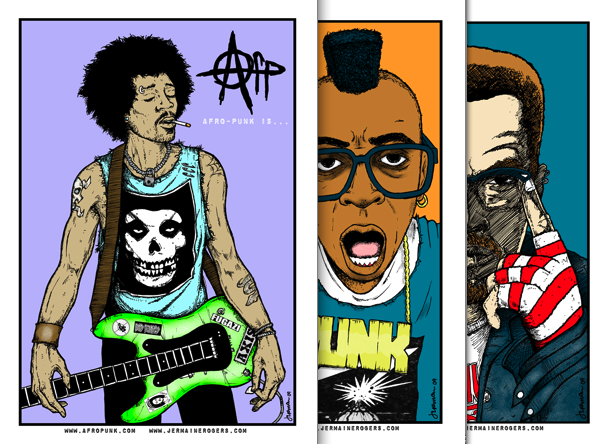 Afro-Punk got hip to our Kickstarter project and contacted us for a writeup. This was an awesome feat for our team as we are inspired by Matthew Morgan and James Spooner’s seminal documentary film Afro-Punk (2003) which examines how an international network of young Black artists and aficionados are increasingly identifying with alternative music and art. Oh and did we mention the annually free Afro-Punk Festival in Brooklyn ( hosted since 2005) that draws throngs of folk from across the globe to jam together to the likes of indie stars Cee-Lo Green, Janelle Monae, Mos Def, Santigold, Fishbone, J*Davey and Saul Williams, among others. Dopeness in a basket. The political world temperature right now is at an historic high. From a revolution that began on the streets of NYC to youth in London and the Middle East taking part in uprisings against oppressive governments, a La Résistance mindset rules the day. In Accra, Ghana, a couple of visionaries are building a movement of their own; one part indie artist collective, one part community dialogue generator, ACCRA[dot]ALT tackles head on the issues facing not only the music community, but society as a whole. With monthly events like the Talk Party Series, ACCRA[dot]ALT founders Mantse Aryeequaye and Dr. Sionne Neely provide a space for the open exchange of ideas and the non-judgmental exploration of cultural mindsets on topics that may have been deemed too taboo for discussion before now, with a desired effect of increased unity, tolerance and respect.